Ravens Wyrd is named after Odin's two ravens, Hugin & Munin (Thought and Memory), who set out each day to gather information and bring it back to Odin. As Wyrd is the path one travels in life; everything that you have been, are now or ever will be, Ravens Wyrd is a home for people from all paths. Pagan, Wiccan, Witch, Therian, Shamanic, Empathic, Otherkin, Energy Worker, and many others. Whatever path you walk, you are welcome. 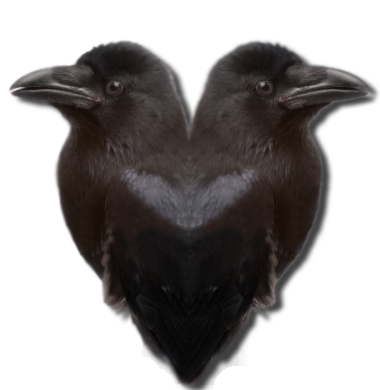 Ravens Wyrd is a community dedicated to learning, teaching and sharing knowledge gained about different paths to better spread understanding throughout the different communities. Hugin and Munin (Norse, “thought” and “memory”) are the twin ravens of Norse mythology. They are the servants of the Norse All-Father, Odin. According to legend, they are sent out each morning and report back to Odin each evening on the happenings of the world. Wyrd is Anglo-Saxon in origin and means ‘to become’ or ‘to turn’; literally meaning ‘that which has turned’ or ‘that which has become’. Wyrd can be thought of as becoming something new, on a new path, while still being able to see that which has passed before back to the beginning and incorporating that into the present. Wyrd is like a giant web, each decision or action is a string tied to your past and present, eventually shaping the way to your future becoming the whole picture of a web. Wyrd is the path one travels in life. Everything that you have been, are now or ever will be.